This 4 Tower-Based outdoor Aluminum Trussing Flat Roofing is a basic structure for the Roofing series. It is 30x30x30ft high composed with Main Grid 390x390mm Quatro Trussing and 290x290mm as Pillars. The Truss System is combined with the Aluminum Mobile Stages which is 28x32ft size and 4x8ft/pcs black colour. And the Stages are equipped with the steps and guardrail which keep you safe. It is with Conical Coupler and it is easy and quick to assemble the whole system. Only with Factory price without any dealer! 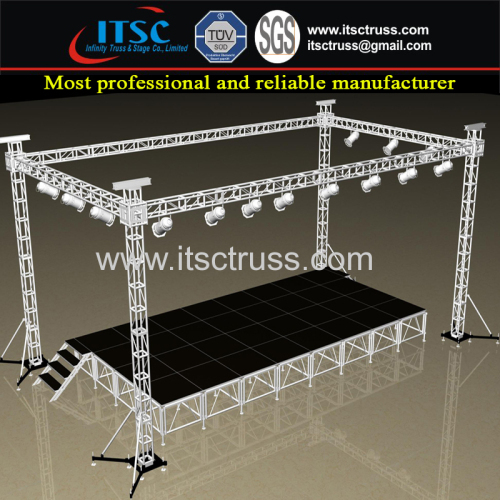 This truss system is applicated in the entertainment field, such as the DJ events, Weddding events, Roadshows, Promotion actitivities, hanging speakers and lighting, car shows, exbitions,ect. All the ships just arrive in Manila in Philipine, and we can service you door to door service for clients from Manila city. If you are out of that city, we still can service you soul and heart, clearing all the items for you and you can just wait and collect your items from our agent's warehouse there. The shipping cost is USD3000 for this 30x30x30ft truss system, and it includes the cost for the customs already.It takes arund 7-10 days to reach Manilar port. Any question, pleaes inquiry ITSCtruss group.